Oh just kill me now. Because you're going to hate me. I just found The Holy Grail Shampoo and Conditioner. But they are going to make you want to eat beans out of a can for dinner all month because you feel so broke. The pair of 16oz shampoo and conditioner bottles cost $100. It only hurts because they are so perfect. Finding a shampoo without the sulfate family present is near impossible. But Yarok uses only lauryl and decyl glucosides as detergents. No sulfate is buried at the end of this ingredients list. 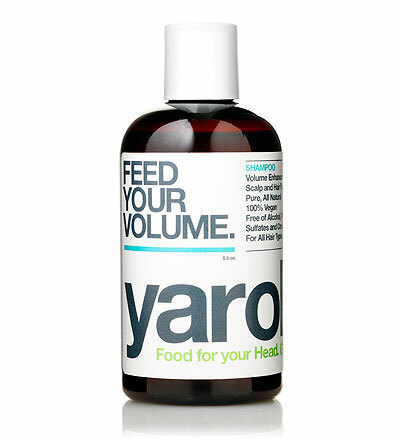 Included in the formula is seaweed extract, which is extremely healing for scalp, especially itchy and flaky ones. They add marshmallow root and slippery elm as conditioning agents for shine and manageability. All the essential oils they incorporate are wildcrafted. The addition of chamomile and calendula is beneficial because they are fantastic skin soothers. The single downside is that they use grapefruit seed extract as a preservative, which can potentially be contaminated with benzylkonium chloride during extraction. As you lather up, you'll notice the atypical scent of the shampoo. It reminded me of an evergreen glade in a snowy winter. It must have been the combination of the atlas cedar and rosemary essential oils. The conditioner has a more earthy scent, from the vetiver and sage. But the performance is where they really stand out. I've never tried a natural shampoo and conditioner duo that gives so much body and shine. Usually one comes at the expense of the other. But not Yarok. Manageability was incredible, and frizz was reduced. Basically, I emerged from the shower into the most spectacular hair day. Now I just have to wait for a sale. Purified water, decyl glucose, lauryl glucose, coco protein, seaweed extract, herbal infusions (coltsfoot*, marshmallow root*, calendula blossoms*, chamomile flowers, chickweed, horsetail, slippery elm, comfrey root, sea buckthorn co2, nettles, oatstraw ), wildcrafted essential oils (lavender*, atlas cedar*, red mandarin*, sweet orange*, rosemary* ), grapefruit seed extract. *Certified Organic ingredient. purified water, vegetable emulsifying wax, herbal infusions ( coltsfoot*, chickweed*, nettles*, horsetail*, slippery elm*, marshmallow root*, comfrey root*, calendula blossoms*, chamomile flowers*, oatstraw* ), jojoba seed oil*, macadamia nut oil, aloe vera gel*, calendula co2, wildcrafted essential oils (sweet orange*, rosemary*, vetiver* ), vitamin c, sage, rosemary, antioxidants, grapefruit seed extract, wildcrafted essential oils (geranium*, tea tree*, lavender*, ravensara aromatica*, rosemary*, lemon*, sage & rosemary antioxidants, grapefruit seed extract. *Certified Organic ingredient. I sought out this product and was not compensated monetarily or otherwise for this post.